My classroom has practically no walls. Wall 1: Student closet, door, my closet. 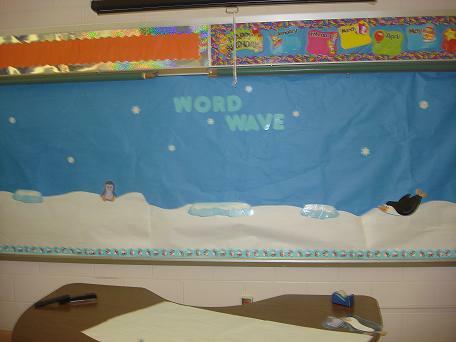 Wall 2: Dry erase board, 2 bulletin boards (one is blocked by the computer desk which can only go in that spot. So annoying.). Wall 3: WINDOWS. Seriously. There is no wall. It's all windows that let in the bright sun and make my classroom a thousand degrees. Wall 4: Chalkboard that is not used. 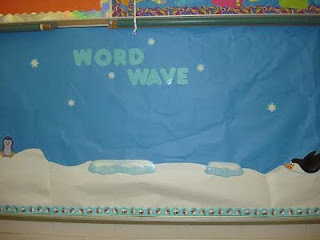 So, this word wall is covering my chalkboard. My theme for my classroom is the arctic for two reasons: I love penguins and I thought maybe it'd make me think I was in a cold place when I'm sweating... Heh. 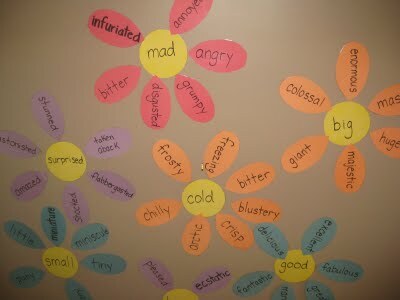 I found this idea to make a word wall garden on pinterest. I'm going to use the same concept, but change the flowers to snowflakes. I'm pretty excited about it! From Teaching In The Early Years. Great idea, huh? Anyway, time for me to look for more great ideas on pinterest! I'm addicted, I tell ya.